What is the style of the training? The style of the training is Unified Yoga™, which is a Registered Style with the Yoga Alliance. Unified Yoga is a unique blend of many different styles (Hatha, Power, Ashtanga, Hot, Yin, etc.). Unified Yoga is less of a ‘yoga style’ and more of a ‘style of teaching yoga’. Peak Beings believes that what the yoga world needs is knowledgeable yoga teachers more than another new yoga style. The focus of the Unified Yoga style is to develop yoga teachers who are knowledgeable, safe, open minded, compassionate and able to help any student develop a yoga practice that works for them. In this non-authoritarian teaching style, each student is given the space and freedom to honor their own body, mind and spirit and find comfort in being who they are. As human beings and teachers we arrive on our yoga mat with different life experiences physically, mentally, and emotionally. Unified Yoga honors and celebrates each student as they are, trusting their intelligence and allowing them the time and space to find the balance, strength, grace, peace or whatever it is they are looking for in their practice that day. The setting of the "practice teaching" for the training is in a vinyasa flow style, but a variety of different styles (Power, Hot, Yin, Ashtanga, etc.) are taught in the morning practice to expose students to styles they may not have tried before. The goal of the training is to learn the tools to teach and then the teacher can utilize those tools to teach in the style that they want and focus on what they want to focus on depending on the students who come to their class. Unified Yoga is the unifying of as many styles of yoga as the teacher wants and learning to adapt them as you like and see fit for your students. The Unified Yoga Teacher Training™ allows every teacher to draw from their own yoga experience in different styles they have practiced and create their classes as they want to or as their students need. Peak Beings values the experience that the practitioners already have before attending the training and wants to build on that experience and knowledge. You will have all the tools you will need as a teacher to design and guide a yoga class safely in any style you like...even if you create your own style. Are there any required texts for the training? There are no required readings or texts to buy for the training. Peak Beings does not want students to have the additional expenses of going out and buying books prior to the training. We feel the 250+ page manual has explores yoga in such a vast way and allows the teacher to have a solid foundation in all the aspects of yoga. If you are looking to purchase any books prior to the training we recommend "Light on Life" by B.K.S. Iyengar or "Yoga Beyond Belief" by Ganga White. The training explores many of the "off the mat" topics such as history, philosophy, yoga sutras, self-exploration, etc. and these books are good to have some insight into other aspects of yoga that may not be covered in a typical yoga class. B.K.S. Iyengar's book will give you a very direct and relatively "dense" view on things like this (but is a harder read) and Ganga White's book is a lighter read with a lighter feel and more of his personal insight. What airport should I fly into to arrive on The Big Island? We recommend using one of the travel planning websites such as Kayak, Expedia or Orbitz to search for your flights and also visiting Hawaiian Airlines and Go Airlines (local airline). Hawaiian Airlines has recently opened up more flight options from the U.S./Canada mainland, Asia and South Pacific. The easiest arrival option is to fly into Hilo Airport (ITO). 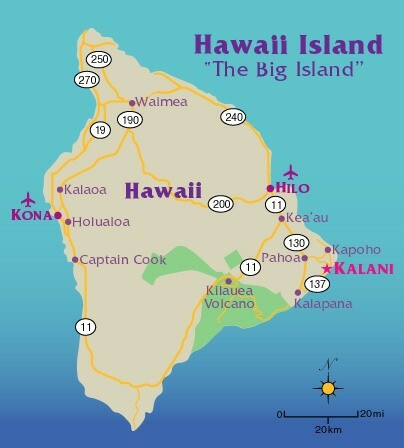 Hilo Airport is only about a 45 minute drive from Kalani Oceanside Retreat. The other arrival option is to fly into Kona Airport (KOA) which is located on the West side of the island and is about a 3 hour drive to Kalani Oceanside Retreat. There are buses going from Kona to Hilo and from Hilo to Kalani Oceanside Retreat. You will have to take a taxi from the airport to the bus stop from either airport. You can check out the bus schedule on the Hele-On Bus website. Please make sure to contact the bus company directly to see if there are any local holidays on your arrival day and/or if the bus schedule will be impacted for any other reason. Additional information for ground transportation is provided below. There are also commuter flights available from Kona Airport to Hilo Airport on Hawaiian Airlines. You can also schedule your flight to fly to any of the other Hawaiian Islands such as Honolulu on Oahu, Kahului on Maui, or Lihue on Kauai and then schedule a separate flight to Hilo or Kona Airports. Several flights are offered daily between the islands with Hawaiian Airlines and Go Airlines. How do I 'arrive at' and 'depart from' Kalani Oceanside Retreat? Transportation to and from Kalani Oceanside Retreat are not included in the cost for the Yoga Teacher Trainings and students attending shall make arrangements for their own transport. You can also contact Kalani directly to arrange transport. If you are arriving into Hilo Airport, Kalani is only a 45 minute drive. Kalani offers transportation (from Hilo only) for $50 or $75 one way depending on whether there are other guests arriving at the same time you are. Contact Kalani directly, at least a day in advance if you would like them to schedule an airport pickup for you. The cancellation policy is 24 hours notice. You can reach Kalani at: 800-800-6886 in the USA & Canada, 808-965-7828 worldwide, and 808-965-0468 locally. Another option is to travel via local taxi. The cost for a mini-van taxi is approximately $100 total (3-4 passengers) and can be shared among training attendees if you are able to coordinate your schedules. A connection email will be sent out 4-5 weeks prior to the training in order to connect training attendees. One Hilo taxi we recommend is Helen's Taxi at 808-895-4400. There is also the Hele-On county bus that leaves from downtown Hilo. This is a slow, but inexpensive ($2.00 each way) option, that comes right to Kalani if you can coordinate your arrival schedule with the bus schedule. You will have to take a taxi from the airport to the bus stop (~$15). Please plan for enough time to retrieve your bags from baggage claim and to get a taxi outside and take the 10-15 minute taxi ride to the nearest bus stop (Prince Kuhio Plaza - Ohuohu Street). The bus will be like an airport shuttle vehicle and will have the word "Kalapana" highlighted above the windshield. The Hele-On Bus drops off at Kalani 3 times per day, Monday through Friday and 2 times per day on Saturday. Note that there is no bus on Sunday. Also, note that the Saturday schedule is different than the Monday through Friday schedule per the Hele-On website. You can check out the bus schedule here on the Hele-On Bus website and looking at the Pahoa/Pohoiki - Hilo Routes. When looking at the schedule, Kalani is located between Pohoiki and Sea View Estates. Please make sure to contact the bus company directly to see if there are any local holidays on your arrival day and/or if the bus schedule will be impacted for any other reason. If you have your own car or decide to rent a car, Kalani is located approximately 20 miles from the nearest town and there are many natural attractions in the vicinity. If you prefer to have your own transportation to explore in your free time, renting a car from the airport is a good option. You can view directions to Kalani on the Getting to Kalani Page. What are the Requirements to enter Brazil? Citizens of the USA, Canada, and Australia are required to obtain a Tourist Visa before entering Brazil. For people traveling from European Countries, a visa is 'not' required for a stay up to 90 days. All travelers must be in possession of a passport valid for 6 months beyond stay and a round-trip airline ticket. To determine if you require a visa and to see the requirements for a visa from your country you can go to this site and enter in Brazil for Destination Country, Country of your Citizenship and select Tourist Visa - Do I Need a Visa? (Travisa). Most visitors will also require an onward or round trip plane ticket proving that you will depart Brazil within the length of your allowed duration of your trip based on your particular visa. In other words, before you arrive it is best to have a printed copy of your return flight that is scheduled within 90 days from your arrival. If you cannot provide this, you may be required to purchase a flight out of the country before they will allow you to pass immigration. Depending on the country you are in, the visa application can take up to 2 weeks. We recommend obtaining your visa as soon as possible in case there are any delays in the processing of your application. You can utilize a processing company such as Travisa where they charge a fee anywhere from $99 to $199 depending on the urgency of the visa or you can locate the nearest Brazilian Embassy here - Brazilian Embassies and Consulates and clicking on your country or you can also do a separate internet search for Brazilian Embassies in your country or where you are currently. It is possible to obtain a Brazilian Visa if you are outside of your country of citizenship, but it depends on the rules and regulations of the Brazilian Embassy where you are located. What airport should I fly into to arrive to arrive on Santa Catarina Island (Florianopolis)? The airport you should fly into is located in Florianopolis and is named Hercílio Luz International Airport (Airport Code: FLN). We recommend using one of the travel planning websites such as Kayak, Expedia or Orbitz to search for your flights. If you are traveling internationally, most flights will arrive into Sao Paulo or Rio de Janeiro and you will take a connecting flight to Florianopolis. How do I arrive to Praia Mole Eco Village? We recommend taking an official taxi from the airport to Praia Mole Eco Village. Transportation to and from Praia Mole Eco Village are not included in the cost for the Yoga Teacher Trainings and students attending shall make arrangements for their own transport. You can get a taxi through a taxi service near baggage claim or you can also get a taxi as you exit the airport. The taxi cost will be approximately $15-20 USD depending on the current exchange rate and traffic. Most taxi drivers only accept cash, so we recommend exchanging your currency into the local currency (Brasilian Real) prior to exiting the airport. Most local restaurants and stores will accept major credit cards (Visa, MasterCard, American Express, etc. ), however some shops do not accept some of these as well, so we recommend having 2-3 of these options if you are planning on using your credit card for a majority of your meals, purchases, activities. Some of the activity companies will only accept cash. The local currency is the Brasilian Real. Other currencies are not accepted at any of the restaurants, stores, etc. We recommend exchanging your money at the airport in case you do not have time to locate a currency exchange during the training. The amount of money you should bring really depends on how much you plan to use cash, the number and type of activities you plan on doing and how much you plan to spend on meals/entertainment. Some approximate costs for meals, depending on the currency exchange rate and the type of restaurant you are eating at will be - Lunch: $5-15 USD and Dinner: $10-20 USD. You will have time to go to a currency exchange during the training as well if you do not want to exchange all of your money at the airport. Do you have a list of recommended things to bring? It is recommended to travel light and remember that you are traveling to a tropical area. Items that we recommend to bring during your trip are: flashlight (essential), yoga clothes, water bottle, sandals/water shoes/comfortable walking shoes, short-sleeve shirts (cotton or light synthetic), light fleece/sweatshirt (it can get chilly at night), pants (cotton or light synthetic), shorts, socks (1-2 pairs), undergarments, swimsuits, light raincoat or small umbrella, hat/bandana, notebook/pen, sunscreen, binoculars, back/daypack, camera, toiletries. We promote natural clothing items (cotton), but synthetic clothing does dry better in the humid environments. Teacher Trainees bring a notebook or journal and if possible an ipod or mp3 player and associated chargers/batteries if you would like to use music during your class. Ipads, iphones, and other tablets are not allowed in Teacher Training classes for note taking. Note: All participants are required to wear a shirt or tank top during all the training classes. All meals and accommodations are included in the training, but if you wish to purchase anything else during your stay you can have it added to your account. Kalani accepts cash, credit or debit cards for any purchases or charges to your account during your stay. You can also obtain cash at the reception area using a credit or debit card. You can receive up to $100 in cash and there is a $5 fee for each withdrawal. There are also ATM's located in Pahoa and Hilo. Kalani does require that you have a credit card on file upon arrival. Hawaii's weather is very tropical, located 18 degrees north of the equator and hours of daylight do not change much throughout the year. Sunrise is anywhere from 5:40 am to 7:00 am and sunset is anywhere from 5:40 pm to 7:00 pm, depending on the season. Daylight Savings Time is not observed, so it is important to check the local time when you arrive. Hawaii, being in the tropics, has very consistent temperatures (at sea level). Hawaii has two seasons: the Summer season is from May to October and the “Winter” season is from November to April. Summer time highs average 85 degrees F, while winter month highs average 78 degrees F. Summer and Winter are both beautiful times to visit Hawaii. The warmest months are August and September. Kalani Oceanside Retreat enjoys Hawaii's ideal climate: light ocean breezes, sunny days, pleasant year-round temperatures (65-85°F) and occasional tropical showers that provide a cooling and nourishing change to the beautiful warm weather. What are the accommodations at the Lodges? Accommodations and amenities vary at each lodge. It is best to visit each lodge's website individually to check on what is provided for you. Sheets, towels and liquid body soap/shampoo are provided. Is there internet/phone access at the Lodges? Internet and phone services vary by location. At Kalani there is wireless internet available at several places on the property. Usage is free, but wireless access is limited in the jungle environment. If you have a laptop, there are wired Ethernet lines (RJ-45 jack) available in the lounge. Kalani also has a computer designated for checking email for an hourly fee. Kalani is out of range for most cell phone networks, however there is some limited reception on the property. Guests with AT&T as their service provider seem best able to get a decent signal. There are phone lines available in the reception and guest services areas from 8:00 am to 8:00 pm. What food and beverages are available? Three delicious meals per day are served on Kalani's open-air lanai (veranda) and are included in the cost of the training. Kalani celebrates the abundance of Hawaii by serving local tropical fruits and vegetables and fresh caught fish. Seafood is often served at dinner (chicken and beef are served occasionally) and vegetarians are well cared for. Any special dietary requirements must be confirmed with your booking through Kalani lodge, as they must order your food in advance. All food is prepared and served with the spirit of Aloha. Kalani cuisine encompasses a variety of styles including Thai, India, and Italian and their chefs have extensive training and a common interest in creating healthful and delicious meals. A sample menu of the meals at Kalani is provided below. Tea, water and coffee are available in the restaurant area throughout the day. There are also sports and other health drinks available for sale in the restaurant. Wine and beer are permitted on property, but not sold. There is a store nearby where you can purchase these items. Yes, laundry is available at the lodges with about a one day turnaround time. The cost varies depending on the host lodge. Are there any dangerous animals, reptiles or insects? In Hawaii there are NO dangerous animals, reptiles or insects. The climate is very tropical, but you DON'T have to worry about snakes, scorpions, bullet ants, jaguars, pumas, etc. like you may have to in places like Costa Rica, Thailand, Bali, etc. The lodges are located in gated communities with 24 Hour security so it is very safe on property as well as in the surrounding community. Unlike places like Costa Rica, Thailand, Bali, etc. you don't have to worry about having your valuables stolen. Theft has never been a problem at any of the lodges and most people leave the doors of their room unlocked. What tours and activities are available to the guests? Activities vary at each location and lodge and it is best to visit each lodge's website individually to see what is available for you. Kalani offers a 25-Meter Half-Olympic Pool, weight room, heated Watsu pool, sauna and two jacuzzis. Please note that Kalani's pool area is clothing optional for Kalani guests that are not attending the training. All yoga teacher training participants are required to wear clothing at the pool during training hours (i.e. 6:00 am to 7:30 pm, Monday to Friday) to assist in maintaining the integrity of the training. Prices vary according to adventure, length of time of adventure and number of guests participating. What other wellness activities are available? Most lodges have spa centers with a range of treatments from massages to various beauty treatments. Kalani offers a variety of additional daily activities you may partake in in your free time. Some of these activities include ecstatic dance, hula, meditation, yoga, weaving, tai chi, martial arts, and volleyball. Most activities and classes last one hour to one hour and a half. You can visit Kalani's Weekly Activity Schedule for more information. What are the options for transportation for leaving Kalani during free time? There are tree options for leaving Kalani during free time. You can schedule a shuttle with Kalani to Pahoa and/or Hilo. The costs are approximately $15 to $45 to Pahoa or Hilo and the cost depends on the number of people traveling. There is also the option to rent cars from Volunteers on property. When available, they will typically rent their personal cars for approximately $25 to $40 for the day. The less expensive option ($1.00 each way) for travel to Pahoa or Hilo is to take the local Hele-On Bus which picks up at Kalani 3 times per day. You can check out the bus schedule here on the Hele-On Bus website and looking at the Pahoa/Pohoiki - Hilo Routes. When looking at the schedule, Kalani is located between Pohoiki and Sea View Estates. The bus will stop anywhere along the route indicated on the schedule, you just have to let the driver know where you want to get off. Pahoa is approximately 30-45 minutes and Hilo is approximately 1-1.5 hours by bus, depending on the number of stops the driver has to make. What are the yoga facilities? Yoga spaces vary by location, but most of them have natural hardwood floors and some are screened in and some are open. Kalani has mats available to use during the training for free. The mats are a typical 1/4 inch (6 mm) thick 'sticky' mat. It is not necessary for you to bring other props (blocks, straps and blankets), but if there are certain props you require or like, please feel free to bring them.